WASHINGTON (PAI) – Brushing aside teachers, unions, and its Democratic minority, the Republican majority on the House Education and the Workforce Committee approved a partisan, ideological rewrite of basic federal education aid law. The measure, approved by 21-16 party-line votes just before Congress recessed in February, rolls 65 education aid programs into a giant block grant, cuts the total money and lets states distribute the funds without regard to whether students and schools are rich or poor. Right-wing Committee Chairman John Kline, R-Minn., crowed that his majority is overturning the 2001 No Child Left Behind Law (NCLB) – which parents, teachers and students all dislike because of its emphasis on “teach to the test” – and returning control to the states and local school boards. “For the last 50 years, Washington has assumed more programs, more spending, and more top-down mandates will cure an ailing education system. We have doubled down on this approach time and again, and it isn’t working. Federal control over the nation’s schools continues to grow, while student achievement remains stagnant,” Kline declared. Teachers Union (AFT) President Randi Weingarten had a completely different take on the GOP-rammed bill and pro-worker, pro-student amendments lost in committee, also by party-line votes. “The Student Success Act is a misnomer,” she said of the House bill. “In reality, it would rob poor and struggling students of the resources, supports and funding they need to succeed. The bill pulls us further away from the core purpose of the Elementary and Secondary Education Act, which is to level the playing field for all kids. And Lily Eskelsen-Garcia, president of the National Education Association, was just as scathing. “The high stakes that are tied to those tests and the lack of attention on what really matters – the opportunities we’re providing our students across ALL zip codes” is “the real heart of the problem” with the GOP rewrite, she said. Since it was converted into No Child Left Behind, education law “made no real progress in closing achievement and opportunity gaps for our students. Instead, it has perpetuated a system that delivers unequal opportunities and uneven quality to America’s children. Besides converting education aid into a block grant – which, Weingarten says, is exactly opposite of the original goal of federal education aid 50 years ago-the GOP inserts what it calls “portability,” letting federal money shift from school to school, regardless of type. That drew the ire of Diann Woodard, the School Administrators president, as well as Weingarten. Letting states “make Title I funding ‘portable’…undermines Title I’s fundamental purpose: To assist public schools with high concentrations of poverty and high-need students, and (it) denies districts the ability to target the funds to where they are most needed,” Woodard said. Title I is the federal education law’s section that channels aid to schools with high proportions of poor students, and to the students themselves. Woodard also warned that while the House bill restricts portability, right now, to public schools, it could easily be extended to private schools. That was a key, but unstated, aim of the Bush-era NCLB: If a public school “flunked” – and standards were set in such a way to guarantee that thousands flunk – the money would flow to private schools instead. “Many states to use the funds for vouchers, which would allow public funds to move to both public and private schools,” Woodard warned. “Some Title I portability proposals have been limited to public school portability, but they are designed to make it easier for states to implement private school vouchers as a next step. “Accordingly, AFSA opposes any attempts to include provisions supporting Title I public school portability” in a federal education aid bill, “even if it limits portability to public schools,” the union said in a letter to lawmakers. Other unions, civil rights groups, the ACLU, and the AFL-CIO co-signed the letter. Weingarten said the House GOP’s portability scheme would funnel more money to well-off school districts while yanking it from districts, students and schools that really need it. In one example, a recent study of the potential impact of portability shows it would cost the majority-minority Chicago public schools some $30 million in Title I funds. Most of the students in those schools are poor. But the new formula for distributing money would be based on other factors. As a result, while Chicago would lose millions, the schools in its well-off suburb of Naperville would gain $184,000 under the portability sections of the House panel’s bill, the study calculates. Similar shifts in federal education aid would occur from other cities to their well-off suburbs, it adds. 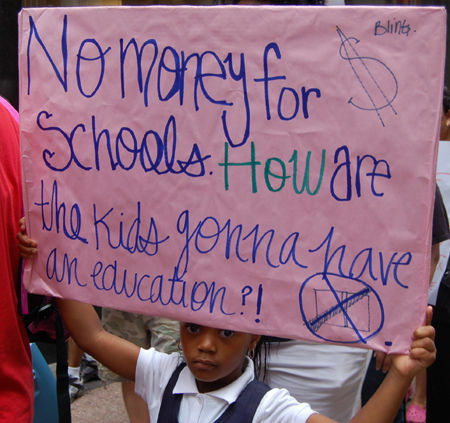 Photo: Chicago demonstration and school boycott over cuts in funding and closing of neighborhood public schools, August 2013. People’s World Flickr.